And here’s the problem: they’ve become accepted as a normal part of the American diet. For example, chips or fries are typically served alongside any traditional American meal. Plus, when you eat deep fried foods often, you really begin to crave them above all else due to the high fat, salt, and refined carb with content the food contains. Deep fried foods are especially troublesome because the deep frying process is really unnecessary. For example, look at a normal potato. You can slice it up and bake it in the oven. That gives you zero grams of fat and 110 calories if you eat the whole potato. And if you’ve ever had a potato in its natural form like this, you’ll know just one can be really filling! Now, imagine you take those potato slices and deep fry them in a vat of oil to make traditional French fries. Suddenly, that healthy potato from before is worth 18 grams of fat and 380 calories! Basically, deep frying food can easily at least triple the amount of calories and fat in a food, which means if you eat fried food, you’re getting so much unnecessary fat and calories added into your body. 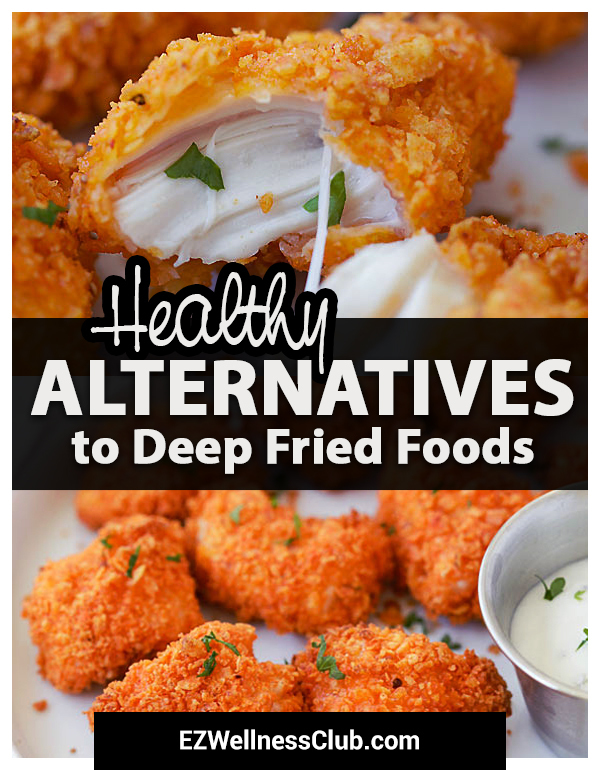 So, wouldn’t it be better to just avoid deep fried foods all together? Yes, but don’t worry—I’m not gonna leave you hanging with just that advice. Below are some great tips for making alternatives to your favorite deep fried foods. Looking to shed extra pounds quickly? Pounds and Inches Drops are designed for RAPID weight loss! They help burn fat (in the right places) by increasing focus and decreasing hunger. Order yours today here! Instead of fast food fries, make your own baked fries (there’s a great recipe in this article) or cut up fruit or veggies for a great snack—like carrot sticks! Instead of fried chicken, look up a great recipe for baked chicken or tofu (or buy the baked version at the grocery store). Instead of normal chips, make sweet potato chips in the oven. If you love potatoes, have a baked potato but opt out of the sour cream or butter. Bake a potato at home and add hummus or salsa instead! Use these deep fried foods alternatives to help jumpstart yourself to better health. And for an even bigger benefit, supplement your non-fried diet with extra nutrition from Mimi’s Miracle Minerals and Mimi’s Omegas.